View Legal: How gift and loan back arrangements work? How gift and loan back arrangements work? Previous posts have touched on various aspects of the gift and loan back strategy (see http://mwbmcr.blogspot.com.ar/2012/05/family-court-case-on-distinction.html and http://mwbmcr.blogspot.com.ar/2013/10/one-remedy-where-trust-distributions.html). Recently, and as touched on last week regarding Atia’s case, one of the key aspects of the enforceability of this style of arrangement is that all documentation is drafted correctly and duly signed and processed. In this regard, the main critical steps that need to be followed are set out below with an example. 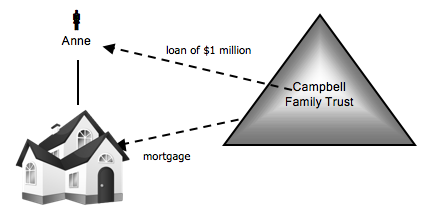 The ‘gift and loan back’ approach involves the owner of an asset gifting an amount equal to their equity in the property or shares in a company to a family trust (or low risk spouse). The family trust then lends an amount of money to the owner and takes a secured mortgage over the property or registers a security interest on the Personal Property Securities Register over the shares. 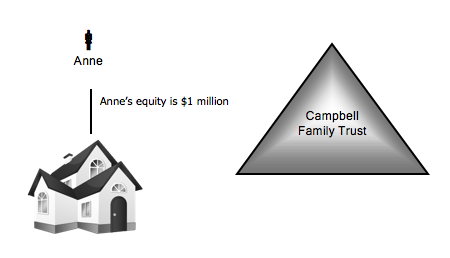 Using property as an example, assume that Anne holds 100% of an investment property and the current value of the home is $1,500,000. There is an existing mortgage of $500,000 owing to her financier.